The Carpathians - the longest mountain chain within Europe besides the Alps - comprise unique ecosystems and an extraordinarily high biological diversity. About 16 to 18 Mio people live in the region and it is a refuge for endangered species like bears, wolves, lynxes and birds of prey. There are about 4000 endemic and partly heavily endangered plant species existing in the Carpathians. The Carpathian Convention, which stands for a balance between economic and social development and the preservation of the local ecosystems, was signed by all 7 bordering nations in May 2003. In the Carpathian Arc a massive and rapid human migration away from the mountainous regions is taking place. The uncontrolled migration of the younger and more educated part of the rural population leads to a depopulation of whole villages and the loss of traditions and knowledge. This leads to landscape management problems, such as natural succession and fruit and berry groves turning to woodland. Within the cities the migration leads to excess human labour which can hardly be dealt with. Increased unemployment in the cities and a depopulated rural area, with all its socio-economic consequences, is not wished for by anyone. 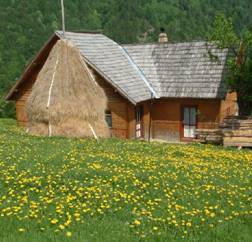 Here the proposed programme intervenes: In different countries and regions of the Carpathians, tourism in the rural areas is increasing. Traditional livestock breeds and groves with the fruit and berry varieties which are typical for the Carpathians do not only help to protect biodiversity but are also a target for tourists, promote regional mar­keting structures and the sale of regionally adapted products. The agricultural use and conservation of local breeds and plant varieties and the marketing of their special products not only provide opportunities for rural development, it is also a method of sustainable conservation of the genetic diversity of the region. The concept of a programme to gather data and work out long term strategies for the Carpathian region has been in development by the SAVE Project Office since 1995. A Workshop to gain an initial overview took place in Romania in 1999. Roundtable and small groups discussions developed a list of cultivated and useful wild plants which are the most endangered and should be conserved as a priority. An analogous list for livestock breeds showed the necessity for urgent actions in the Carpathians and their foreland. Participants also stressed the importance of common action. They agreed to become network partners of crossborder cooperation to rescue endangered livestock breeds and plant varieties. They stated their readiness to make available their facilities and knowledge, and will also raise awareness in their countries on the need to conserve endangered agrobiodiversity in the Carpathians. 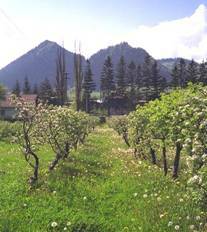 Traditionally about 20 different fruit species are being used in the Carpathian countries. Many of these are adapted to a climate of more than 800 m altitude, thus the genetic resources which are still existing there are of value. The Czech Republic as well as Slovakia are well known for the many apple varieties, which have been cultivated at the end of the 19th century. However, the orchards are often old, with many of the trees being more than hundred years of age. More than 65 pear varieties which had been cultivated in the East Romanian Carpathians were lost during the last 30 years. In Ukraine, Poland and Romania there are many local varieties of walnuts and sweet chestnuts which are not yet recorded. Sorbus domestica, Moravian Mountain Ash and Cornel Cherry are fruit varieties that are still used in the Car­pathians. Nevertheless diversity is decreasing rapidly in these regions, as the last years have shown. promote a “consciousness” among the local people for the (re-)cultivation of old local varieties. Traditional agro-eco-systems are characterised by a regional blend of wild and domesticated animals and plants. Over hundreds of years these have been cultivated and managed in a way that makes them perfect for the landscape they inhabit and the culture they provide for. The modernisation of agricultural systems in the 20th century led to a move away from these traditional systems towards more technology-based systems. The countries of the Carpathians have undergone significant changes in the last twenty years, it is very important, especially for rural areas, that cultural heritage is not lost. Traditional agro-eco-systems need to be re-established in order to conserve agrobiodiversity and to support traditional rural cultures. Partners with an interest in the conservation of autochthonous livestock breeds of the Carpathians should be networked with the aim to build up Ark Farms for conservation, breeding management, education as well as rescue of important animals. The Ark Farms will then be connected to the SAVE networks: European Livestock Breeds Ark and Rescue Net (ELBARN www.elbarn.net), Arca-Net and Agrobiodiversity Net.